Does 'Direct Reality' have anything to do with Project Scorpio? With just under three days left until Microsoft's big E3 2017 presentation, the tech giant has filed for a mysterious trademark that could possibly shake up its gaming repertoire. 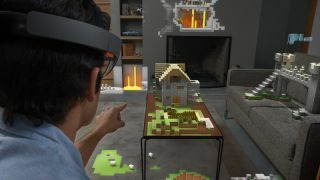 Microsoft has applied for a trademark patent for "Direct Reality," which is described as "computer software for holographic applications," according to GameSpot. Though "holographic applications" could apply to just about anything related to augmented reality, the application specifically covers gaming software. This could potentially mean some kind of gaming take on the software powering Microsoft's HoloLens augmented reality headset. Given the proximity to Project Scorpio's reveal next week, it's also possible Direct Reality refers to a technology on the upcoming 4K-ready console. While we know Project Scorpio will get VR support of some kind down the road, it's possible Direct Reality could refer to an AR equivalent, and possibly even HoloLens support. However, this is us speculating and it's worth pointing out that Microsoft's trademark application is not a guaranteed confirmation of any announcement just yet. That said, we look forward to learning more about what is in store for Xbox when Microsoft holds its E3 press conference this Sunday, June 11, at 2pm PST/5pm EST/12am GMT on Mixer, Microsoft's reinvigorated video streaming service.